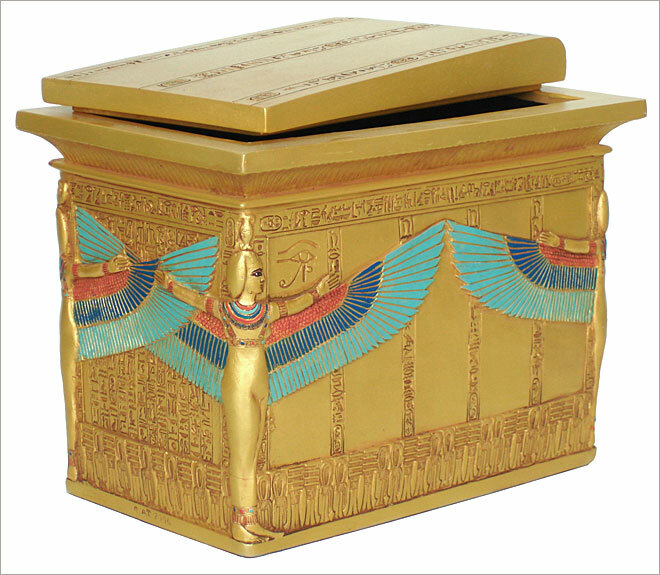 Sarcophagus box of King Tutankhamun, King Tutankhamun, King Tut, Egyptian statues, Egyptian gifts. Egyptian Museum, Cairo, Dynasty XVIII, 1347-1237 B.C. This reproduction shows the larger sarcophagus of King Tutankhamun that held his three inner coffins, one inside the other. The decoration of this sarcophagus is dominated by the four guardian goddesses carved in high relief at each corner of the sarcophagus. The four graceful godesses are depicted in a protection pose with wings outspread and arms circling the sarcophagus as if protecting the body of the king. They are Selket, Isis, Nepthys and Neith. The sarcophagus is also carved with hieroglyph texts of magical spells to protect the king in the afterlife.